One parent letter per comprehension strategy. I created them for my first grade families but the letters could be used in any grade to explain comprehension strategy instruction. Using Glogster, I created this glog for a class project. I now use it with students. 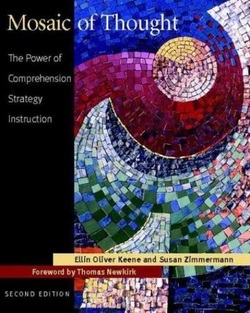 This book, Mosaic of Thought, Ellin Oliver Keene, was the first book I ever read about Reader's Workshop, my inspiration. My second book was Reading with Meaning by Debbie Miller....to this day, these two books are still my favorites. A big part of implementing Reader's Workshop is teaching the routines and procedures of the workshop itself. At the beginning of the school year, you will spend approximately 6 weeks of procedural minilessons teaching students the reading behaviors that good readers think and do. I found some great ideas on Holly Nowalk's website under the reading tab. She has created many resources from Kathy Collin's book, Growing Readers. I have created the minilesson for Determining Importance from the chapter in Debbie Miller's book, Reading with Meaning, they are located on my original website, www.hellofirstgrade.com, under the Literacy and Language Page. I have created these notebook to model the different features of nonfiction texts. To use the Feature Pictures download file, there are four to a page, if you have 24 students in your class, then you should print 6 sheets.